Thousands showed up to the opening Carlo's Bakery -- from the hit series Cake Boss -- in The Woodlands. THE WOODLANDS, TX (KTRK) -- Thousands of people lined up to meet the Cake Boss at the Woodlands Mall on Saturday. Buddy Valastro is the star of the well-known cooking show 'Cake Boss.' In the show, viewers watch as Valastro and his team create elaborate cakes at Carlo's Bakery in Hoboken, New Jersey. 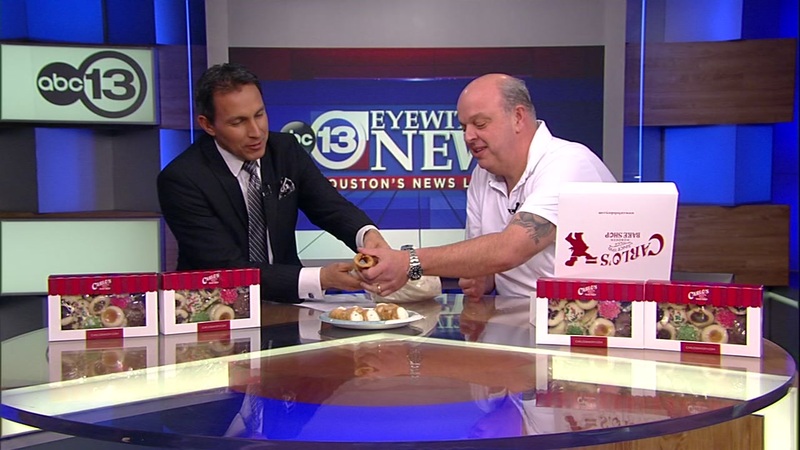 He has since opened several bakeries across the country, with his latest location now open in The Woodlands Mall. It will feature delicious desserts, including Valastro's favorite, a cream-filled pastry called the lobster tail. "We bake on the premises. There's an oven in there. We bake everything, that's the same exact lobster tail you could have in Hoboken, here in The Woodlands," Valastro said. Organizers expected a crowd of 5,000 people to turn out. Fans filled the mall, forming a line that wrapped around the outside. "Looking around, it's one of those moments in your life where you're like, 'Pinch me! Is this really my life?' You see all the love from the fans, and I want them to know I love them back," Valastro said. You can find Carlo's Bakery in the lower level of the Woodlands Mall. The Houston area is about to get a whole lot sweeter! Carlo's Bakery, the bakery behind the famed reality series 'Cake Boss,' is opening in The Woodlands this weekend.